The Power Supplies Unit is responsible for all DC power converters for the magnets of the Injector and the Storage Ring of ELETTRA. The low frequency (DC to 100 Hz) power supplies for the Electromagnetic Elliptical Wiggler, used by the Circularly Polarised Ligth Beamline, the DC power supply for the SR FEL modulator as well as the small power supplies for the correction coils mounted on the Insertion Devices have been specified, installed and are under the responsibility of the Unit. 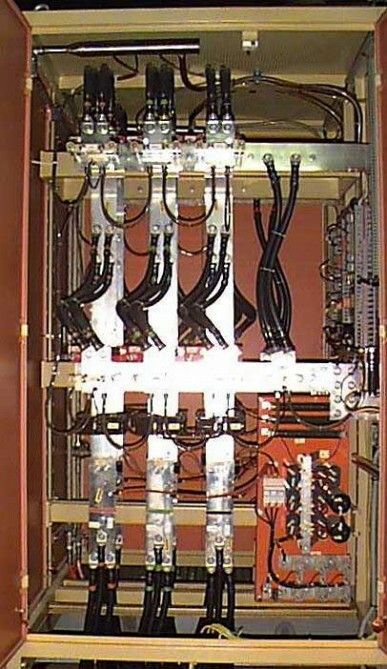 The activities of the Unit comprise the study and the specification for power supplies required by new projects (due to the size of the Unit the objects are ordered to specialized companies, only few and small items are assembled in house), the factory testing, the installation and putting in service of the new converters. The ordinary and extraordinary maintenance along with the study and the implementation of upgrades on the existing equipment are part of the duties of the Unit. There are more than 300 highly stabilized DC magnet power supplies for the Booster and the Storage Ring of Elettra.